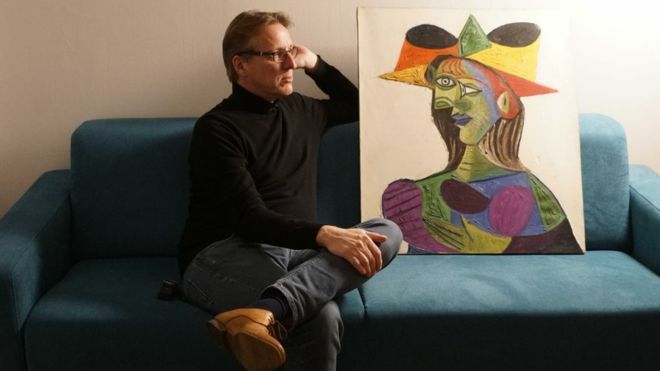 A Dutch art detective says he has recovered a valuable painting by Pablo Picasso 20 years after it was stolen from a wealthy Saudi's yacht in France. Arthur Brand said today that he took possession two weeks ago of the 1938 painting "Buste de Femme'' after trailing it for years in Amsterdam. Brand, a renowned sleuth whose previous finds include a pair of bronze horses sculpted for Adolf Hitler, has since handed over the painting, which he estimates to be worth some 25 million euros, to an insurance company.